Southeastern Grocers is a supermarket portfolio based in Jacksonville, Florida. It operates as the parent company for Harveys, BI-LO, Winn-Dixie, and Fresco y Más. my.segrocers.com is a platform for Southeastern Grocers retail or store/field support associates. 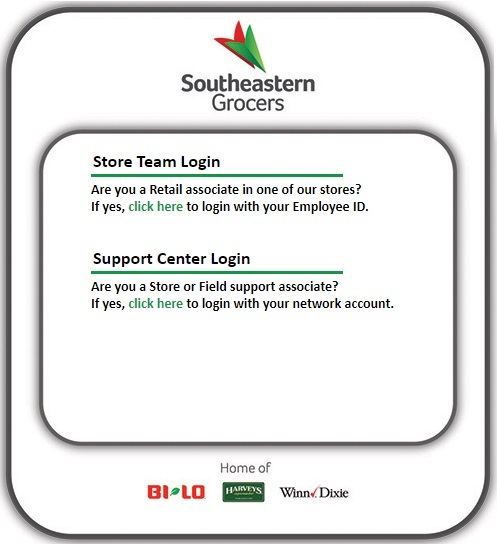 In this Southeastern Grocers login guide, we are going to show you how to log into the Southeastern Grocers employee portal on computers and mobile devices. Open a browser of your choice, and go to my.segrocers.com. There are two login options on the Southeastern Grocers employee portal: Store Team Login and Support Center Login. If you are a member of the store team, choose “Store Team Login“. You will be redirected to the employee login form. Enable the “This is a private computer” feature if you are signing in from a secure computer. Enter your “Employee Number” in the first field of the login form. Click “Log On” to complete the Southeastern Grocers login process. Note: If you are a member of the support center, follow the steps above, except for step 3 (where you have to choose Support Center Login), and 6 (where you will enter your User Name). There are two options on the login landing page: Store Team Login and Support Center Login. Choose “Store Team Login” if you are a member of the store team. On the next page, input your “Employee Number” and password. Check the “This is a private computer” box if desired. Tap “Log On” to access your account. If you are a support center member, choose “Support Center Login” at step 3, and input your User Name instead of your Employee Number at step 4. Note: Southeastern Grocers does not currently have mobile apps for associates. However, if you want to access your account on the go, you can just follow the steps above on any mobile device browser. The most common login issue that users encounter is losing or forgetting their password. If you are a store team member, and this happens, click the “Forgot Password? Click here” link on the login page, then follow the prompts to complete the password recovery process. If you remember your password, but it isn’t working, it is likely that it has expired. Southeastern Grocers employee passwords expire after 90 days. Keep in mind that your account will be locked for 30 minutes after six failed login attempts. In this case, all you can do is wait for the specified period to elapse before signing in again. If you want to start a career at Southeastern Grocers, visit their Careers page. For further assistance regarding the Southeastern Grocers login process, contact Southeastern Grocers directly using the information below. The Southeastern Grocers login platform is for Southeastern Grocers retail or store/field support associates only. I tried to call to set my pin for the new plenti card,they said there is an hour wait time,log into segrociers.com, there is no where to set up a pin#, so what do we do now. Just keep calling the number and hope someone will answer and help set up our pin? The my.segrocers.com website is only available for employees of Southeastern Grocers. If you are a SG employee, you have to log in with your employee number or username, and password. You do not have to set up a PIN. I have tried for a week now to get through to you. This has to do with your changing benefit cards again to us — it’s very annoying. I have held on the phone up to an hour 3 times. I have 2 of your new cards — one for me and one for my husband and I want to have them linked so that our family gets credit on both of them. We do not represent Southeastern Grocers. If you are trying to get in contact with them, please use their contact us page. Alternatively, call their HR Call Center at 1.855.473.6763.